Did I mention I&#39;d been ill? AT WHICH POINT DO YOU WANT ME TO SAY I CAN'T COPE? I JUST WANT A REST. So he went shopping. 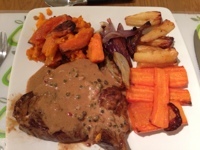 He cooked me a delicious steak in peppercorn sauce. He cleared up. He put the Boy to bed whilst I bathed. He brought me a cup of tea in the bath. I got a lie in, albeit woken up already by the Boy but at 8.30 (not bad), and I have just finished my breakfast in bed, which was two warm croissants with slithers of butter and blueberry jam, oh and with a cup of tea. Thank you Mr Humdrum. It's just what I needed.